P.J. Cimino, M.D., Ph.D. is board-certified in anatomic pathology and neuropathology. His clinical specialty is focused on diagnostic neuropathology, with a particular interest in brain tumors. He is actively engaged in the University of Washington’s Alvord Brain Tumor Center weekly interdisciplinary neuro-oncology tumor board. He is a member of several local and national professional organizations including the Fred Hutch/University of Washington Cancer Consortium, Seattle Tumor Translational Research (STTR) program, the Society for Neuro-Oncology (SNO), and the American Association of Neuropathology (AANP). Dr. Cimino earned his M.D. and Ph.D. degrees in the combined Medical Scientist Training Program at the University of Washington, Seattle. 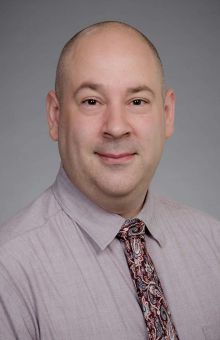 Following his doctoral training, he completed clinical training in a combined anatomic pathology residency and neuropathology fellowship program at Washington University in St. Louis/Barnes-Jewish Hospital. During his post-graduate training in St. Louis, he also conducted post-doctoral level research related to small animal models of pediatric brain tumors. Dr. Cimino conducts collaborative translational research in the field of neuro-oncology, with several projects involving human molecular genetics and small animal models of adult brain tumors, including meningioma and glioblastoma. He is interested in identifying new prognostic biomarkers for brain tumors and developing these markers into potential diagnostic tests. Furthermore, he extends these biomarker findings into small animal models of adult brain tumors to understand mechanism of disease, while at the same time leveraging them as a pre-clinical platform for studying therapeutic strategies. The overall goal of his research is to better understand the biology of brain tumors and develop new testing strategies for accurate brain tumor classification and risk-stratification of patients.